Lack of time, and any 3G on the ipad curtailing news this week, although at least the emails seem to be working again now! A busy few days and the horses all running well. Lovely to welcome EPDS racing last Saturday morning, to see their horses. Dontminddboys about to make his debut over here, he is entered at Chepstow and Warwick next week – an exciting addition to the team for this season, he will be a chaser in the long term, but is a lovely athletic horse who is working well at home. Anti Cool was all dressed up and ready to go, but has sadly picked up an injury which will see him out of action till around Christmas – frustrating for the EPDS members, who have been nothing but brilliant about it, and to a man only concerned that AC is OK – which he will be. Galactic Power standing in for the EPDS 10 Partnership whilst AC mends, and surprising us by getting into the bumper at Uttoxeter when looking sure to be balloted out. He finished in the middle and race a decent race on what ended up very dead ground. He will be better with some hurdles in his way, and will hopefully give the members some fun days for a while. Dans Quest and Point of Attack both running solid races at Stratford, Dans’ first time over hurdles, and PoA first time back after a wind op – which has clearly worked! Off to Ascot today with Restless Harry and Garrahalish. Stiff tasks for both, and the ground probably on the quick side for Harry, but both in good heart and hoping for big runs. A busy week one way and another and a frustrating one too! The emails have been down again, which has caused no end of headaches. Most of our communication to our partnership horses is by email and so when its not there it causes problems. After nothing working it then saw fit to dump 80,000 messages into my inbox! Thanks to Max Ross for finally managing to sort it all out. So apologies for lack of communication and hopefully normal service will be resumed now! Thomas Crapper made his fencing debut at Cheltenham last week – a very nervous day, a good crowd of Crappies there to support him at his favourite track – all looking a bit pensive beforehand. After making a bit of a mess of the first he got better and better with each obstacle and was brilliant at the last two when the chips were really down. Landing in front I thought we had got it at the last but the winner (who won the Scottish champion hurdle) found a bit more toe up the run in than TC and he just got touched off for second on the line. A really good run and over a slightly inadequate trip – he looks as if he will be as good a chaser as hurdler. Exciting. Page won the BTO which was a generous £150 – thank you Cheltenham. Sunday saw Kitegen and Under the Phone off to Kempton, Kitegen having his first run for a while and running a very decent race to be third. Not helped by the last fence being omitted and a very long gallop from the final fence to the line. He never runs a bad race and is as game as they come. Under The Phone was fourth behind Be My Witness last time out, which was not quite how the script was meant to read! However he was not beaten far and over a trip that was too short. 100/1 did seem a tad rude as they went off to post, and UTP thought so too. He can get a bit buzzy so Charlie was keen to settle him, which he did and jumped so much better for less rushing. He made steady headway down the back and stayed on to finish a very pleasing fourth. About time The Tricksters had something to smile about, and there was a good turnout of them to welcome the pair back in. This will be a lovely horse and will jump a fence in time, but should be a fun hurdler on the way there. Southwell yesterday with Dancing Daffodil who had lost her way last season, but summered really well, and all credit to the team – she looked an absolute picture beforehand. Jumping and travelling very happily she was a pleasure to watch – top weight just catching up with her as they turned in, and our neighbours’ horse looking booked for an easy win, when he fell two out leaving Daffodil in the lead – interference from the faller cost us dearly I think as she just had to get galloping again and then got caught in literally the last stride of eh race. Frustrating, but thrilled to see he back on form. Lovely to see John and Margaret Cooper there, who love Daffodil and were delighted to see her back in the winner’s enclosure. Be My Witness our other runner – sadly Mrs Merry not able to come and another the bookies were being pretty rude about despite her win last time. Making virtually all she was headed turning in but stayed on well to finish sixth. Pleased with her and another that will want a bit further. Toby again giving her a lovely ride. Everyone home safely and in one piece which is always a huge relief! No runners this week end, but looking forward to welcoming EPDS racing here tomorrow for a visit. After the excitement of Be My Witness winning last week, there were the nerves of Garrahalish having his first run over fences this week. Bought as a chaser, winning two over hurdles last season was a bonus. He has always jumped well and certainly schooled brilliantly at home, so Charlie was very much looking forward to the ride. Personally I was a bag of nerves, and not helped by Toby who was even worse than me! However we need not have worried as ‘Gorgeous Gary’ gave an exhibition of jumping and did not put a foot wrong the whole way, winning by a cosy 4 lengths. I think it will be hard for Charlie to ever find a more enjoyable first timer – ever! To say that the Just 4 Fun partners were pleased would be something of an understatement – they very nearly carried horse and jockey into the winner’s enclosure, and made a big dent in Towcesters’ champagne supply! Thank you to the track for accommodating them all in the winner’s box, and hope there was some fizz left for later winners! Towcester was looking a shadow of its former self with the dog track being built and now blocking most of the view down the back straight which is very disappointing. Think I upset Robert Bellamy by commenting on it on Twitter, but only saying the same as everyone else – there was a communal gripe in the stands from anyone that you cared to eavesdrop on! The stable lad’s canteen also moved to a tent with extremely substandard food – again a communal moan – the legendary Towcester breakfast a thing of the past apparently. Having said all that, the actual day was, as always, a pleasure. Towcester has always been a favourite, they look after their ground well, and there is always a great atmosphere, and as I said earlier the winning crowd were made very welcome. I just hope that they don’t lose all that with the introduction of the dog track. Rant over - I must not forget Jackfield who made his racecourse debut in the bumper. ‘Gus’ and Joe had a horrible run in the early part of the race, but settled in and then ran a very creditable race to finish third. A good effort from him. The winner is highly regarded and we were very pleased with our boy. Jackfield is for sale (to stay in the yard) so if you would like to get involved do give a call. It’s great to get off to such a good start with the early runners, and also to get a good write up in the RP as well! Miracles do happen! The team all thrilled here and looking forward to the rest of the season. The Blue Boar was the chosen destination on Wednesday evening with some of the Just4Fun group as well as most of the home team. A big thank you to John & Pat Porter who generously fed us all – a very good supper and a pub that could not be more accommodating – recommended if you are in the area! After a day in Ireland on Tuesday working and then all the emotional turmoil on Wednesday it was quite hard to get going on Thursday – Graham Potts in for his weekly visit – happily not too much to do. Lovely to welcome some new faces to the yard this week – Jeryl & Stewart Stone here on Wednesday to see Routine Procedure, who they loved and they are now part of ‘The More The Merrier’ partnership. Mr & Mrs Bowcett here today to have the grand tour, and a look at some of the partnership horses. Clint and Donna Taylor also getting involved with Anti Cool and Routine Procedure after their visit last week. The partnership horses seem to work well, and we have several on the go now, those that are run from here and also the two EPDS horses. John Powell’s’ groups are run virtually identically to ours – it’s a great way to get involved for a very reasonable cost. No runners until the end of next week – the nerves heading for the shredder again when Thomas Crapper is likely to make his chasing debut at Cheltenham on Friday! Other possible runner are Kitegen, Entertain Me and maybe Restless Harry if it rains a lot! After what seems like months of no runners it was great to get out this week, with Entertain Me (Charlie) and Galactic Power (Paige Jeffrey) both running nice races at Chepstow on Tuesday. Windy Miller hugely improved to finish 3rd at Wolverhampton under the impressive William Carson. To Warwick yesterday with Under The Phone and Be My Witness. Under the Phone’s first run for us and The Tricksters, a lovely horse who will want further, but the mission was to find out a bit about him, He was a bit keen early but ran well to finish fourth. Further required to see him at his best. Be My Witness was to make sure that there was plenty of pace on, and although she was allowed to lead the other runners under our amateur, Toby Wheeler we were expecting to see her get outpaced as they got near home. ‘Spice’ had other ideas though and as they turned in Toby still had petrol in the tank! With AP and Harry Skelton bearing down on him, Toby kept a cool head and went to the last as if on a handicapper – the filly was excellent and a great jump at the last saw the pair land running, and despite his best efforts the champ could not get past our game filly! A first win for Toby so a day he will remember for ever. Most of the team had come to Warwick to watch so there was plenty of cheering from the last to the line! Not least from Tobys' mum Julie who was seen needing a fairly large tissue supply! Sadly Mrs Merry not feeling up to the trip, but was also cheering from a friends’ sofa as she watching on the TV! Slightly disappointed that AP could not have been a little more gracious in defeat – we all know that he hates to be beaten, but a ‘well done’ to Toby would have meant a lot. An outing to The Bell in Stow to celebrate last night was very enjoyable, when the home team joined Mrs Merry to raise a glass to the winning pair. Tobys' family there too so a good night! Happily all the horses fine after their runs. The other big event of the week was Hollie Rooney’s 21st birthday! Holly has been with us since she was 14, and the team were keen to organise a bit of a bash for her – after quite a bit of subterfuge and with the help of her parents and boyfriend Ben Poste, we managed to pull off a complete surprise party in the marquee that Nic kindly left up after Open Day! Two BTO’s for Holly this week with Windy Miller at Wolverhampton and Under The Phone at Warwick helped her week along nicely! Firstly apologies for lack of news for the last week – especially after Open Day! A manic week before that was followed by a trip to Ireland in the lorry with Harriet doing her first two star at Ballindenisk – two over night ferry trips, no wifi, and some traditional Irish partying did not leave the brain in the best of places! Back at 5am yesterday and a bit jaded, but a good night’s sleep last night and now back on form! Open Day dawned cold and windy but warmed up into a beautiful day – thank goodness, and about three hundred joined us for what we hope was an enjoyable morning. Lots of lovely comments and emails afterwards so do hope that everyone who came had a good morning. The team on great form and paraded all of the horses – all of whom behaved themselves – a couple a bit on their toes, but good practise prior to the races. We have a good bit to send to the air ambulance as well – a great cause which should not have to rely on charitable funding. We have a few catalogues left – not on the scale of Paul Nicholls’s shiny ones, but a list of the horses and some thoughts so if you would like a copy do drop me an email and we will send you one. Happy to sees to many owners and friends who joined us for lunch after the parade, Brian Kirby as usual doing an excellent job with the pig roast, and Julie and Nicky Venevells’ legendary cakes going down a treat as always. A big thank you to Julie and Nicky, and of course Annalisa, who insisted on carrying on with helping us, after losing Peter only the previous weekend. Peter Venvell had shares in horses with us for many years and it’s hard to believe we won’t see him here again. He was always a great supporter and was full of wisdom and encouragement whatever the circumstances. He will be missed by many. I was particularly sad not to make Peter’s funeral as I was in Ireland, but Robin and several of the team went to pay their respects – Peter would have been so proud of Annalisa in particular, who did his eulogy – brave girl. Great to have a lot of interest in our partnership horses during Open Day, and a new group called The More the Merrier taking on the beautiful Routine Procedure – a stunning horse who will give them plenty of fun. Anti Cool is also now a partnership horse, with John Powell of EPDS racing unable to resist him – shares going fast, so do call or email if you would like to be involved with him. A pic on the horses for sale part of the website – lovely horse and already a winner of an Irish point to point, so proved he can go! The work for the horses now increasing all the time and at last some possible entries starting to appear on the board in the office. Some ‘away day’ gallops being planned so some rain starting to be needed so that we can get to the races before too long. Do hope you can come and see the old favourites such as Restless Harry & Thomas Crapper, and also meet some new potential stars that have joined us over the summer. The team are in flying form and have done most of the preparation already, so today is the final tidy up and finishing touches. Entry is free but we will be asking for donations to the Warwickshire Air Ambulance. Light refreshments are available and there is also a raffle – all proceeds will go to this very worthy cause. For sat nav users – B49 6HS will bring you into Park Lane – just continue straight on past the houses, up the no thru road, and you will come to Alne Park. Watch out for the signs in the village too! A few days away for us this week, and a welcome bit of sunshine! Nice to do nothing for a couple of days, and to catch up with Harriet after her time away in Ireland. Good to get away occasionally, but better to be back! The team holding the fort whilst we were away, and doing an excellent job. Charlie in as usual a couple of days and all went smoothly in our absence! We are a man down for a couple of weeks as Toby has gone to Guillaume Macaire’s in France to gain some experience and practise his French. Harriet filling the gap before she goes off to uni shortly. The work load increasing gradually for the string now, and they all appear to be thriving on it. A couple on the long road to recovery after injury still round the roads otherwise everything cantering away now. After the rain at the weekend we were able to have a pop over the smaller obstacles on the grass today which everyone – human and equine - enjoyed immensely. Really interesting to see the new horses off the ground for the first time – all coping very well and looking like natural jumpers. Dontminddboys, Routine Procedure, Anti Cool, Under The Phone and Galactic Power – the new Irish contingent all pleasing, and all doing the job really well. Restless Harry, Thomas Crapper Garrahalish, Entertain Me, Dans Quest, Alfie (the new Witness Box gelding) and Point Of Attack all looking very professional. Lovely to see Robert Cockerall here with grandson Alfie (aged 1­) who is learning about the joys of racing early! Conway and Lynne Tunnicliffe and Mel Waller who came to see Point of Attack, and also Nick Watson a member of The Tricksters who came to see Under the Phone for the first time. Plans for Open Day now well advanced – just hoping the order for good weather has arrived – do come and see the horses and meet the Team, and have a look at the fantastic facilities we have here at Alne Park. Nice to be back in a proper routine after holidays, flies etc etc. All of the horses look in great order, and seem to be thriving on the work. Lots of visitors recently, and good to welcome several new faces to the groups. Dontminddboys has been very popular and we welcome Malcolm Pitts, Ryan Pearce, Fiona Daniels, Kevin Phelan and William Murphy as new shareholders. 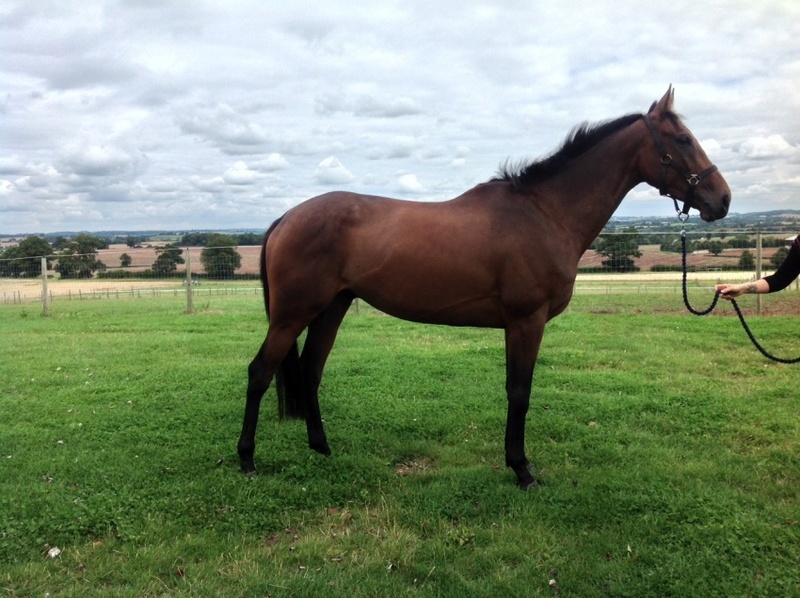 DMDB is thriving, having arrived looking rather skinny, and will run in the colours of EPDS Racing. Just one share left now so do call if you would like it! A personal first for me last Saturday, with a first days racing at Newmarket – somehow have never got there, even after all these years! Harriet Russell who is one of the vet nurses at Three Counties Vet Hospital rode John & Lindsey Clemmow’s horse The Absent Mare over a mile in the charity race in aid of Racing Welfare. Harriet has been riding out regularly here to get fit for the race, hunts regularly and has done all the Pony Club stuff as she has grown up, but had never been on a track before. Abby did a great job of looking after her and they finished a very creditable fourth. By the look of the grin on Harriet’s face she loved the experience and also raised over £2.5k for the charity which was a great effort. Sadly John & Lindsey were unable to go, so Robin & I enjoyed a very nice lunch courtesy of Racing Welfare after the race. Windy Miller at Southwell on Wednesday, running better but not loving the deep sand on the AW. 6furlongs on some fastish turf required for him once he has a handicap. Very excited to say that we are launching a new partnership in a lovely young horse called Anti Cool. By Heron Island, he is the winner of a point to point in Ireland, is a super mover with an equally lovely temperament. Do get in touch if you would like to come and see him, and get involved. Well we survived Big Bertha’s backend this week – actually I think we got off pretty lightly compared to many places. The horses all had a day in on Sunday which they were pretty relieved about, as the rain was horizontal! The team were relieved that it was Sunday and not a riding out day! We did have some visitors on Sunday morning though – brave souls, in the form of Bryan Daniels and friends who came initially to see Garrahalish, In the process of seeing Gary they spotted his next door neighbour Dontminddboys, and it was love at first sight! (Good taste!) There are still a couple of shares left in him, and Fiona Daniels quickly snapped one up. Delighted to welcome her to the team and a good choice on her part! Only two left now so be quick if you would like a share! Racing at Windsor last night, a huge thunder storm just before we pulled out – the ground looked like proper jumping ground and poor Windy Miller got a bit lost in it all! Very impressed with William Carson, who unlike many of the ‘vertically’ challenged had plenty of time to chat, and offer some decent feedback. Harriet has been riding out regularly to get in training for the race, and we wish her all the best for the race and hope she enjoys the experience – and most importantly –wins! Many Thanks to the Clemmows for their support and generosity in letting Harriet ride TAM. Report on the race next time! Harriet back from her Irish adventure this week, very pleased to have her home for a couple of months before she goes off to the Royal Agricultural Uni at Cirencester in October. We are back to a normal routine now, which is actually quite a relief. The horse flies have disappeared back to wherever it is they come from for another year – just hope they don’t find their way back next year! The jumping break over today, at least the ground will have eased after all the rain! Not many runners for us over the next few weeks – the ones that have been going through te summer now having a short break and the main gang not ready yet! A date for the diary is September 14th when we are having our Open Day. Open to all in the morning – do come and see the horses and meet the team. Do hope you can join us! A few ‘tecky hitches’ which explains a news blackout from Alne Park for the last few weeks. Apologies for that but up and running again now! Still on night turnout to avoid the flies, but at last they seem to be abating a bit and we hope to get back to a normal routine next week. The team will be glad to have another hour in bed in the mornings, especially as the days have already started to draw in! Horrors – but at least racing proper is getting nearer! We are very excited about he coming season with some lovely new faces looking over doors, and the team from last year all looking well, after a good summer of nice weather and plenty of grass. The horses that are in have been running really well, frustratingly without getting their noses in front! The Absent Mare has been second twice and third in her last three runs – all good efforts, and she has now really got the hang of the fences – she and Jo seem to have struck up a good partnership. She so deserves to get her head in front – it must come soon! Kitegen was an excellent third at Market Rasen only beaten a couple of lengths, Autumm Spirit has run much better but still does not look particularly in love with the job, Entertain Me pulled up lame but happily is on the mend now and having a short break. Spurned Girl who has come a very long way in a short time and improved beyond all recognition, is also having a short holiday to let it all sink in for a few weeks. Minnie Milan was a good third at Worcester and then sadly went to the sales – and even more sadly won a couple of days later! Annoying to miss the winner, but we wish the new connections all the best with her, and will follow her progress with interest. Lots of visitors over the last few weeks and a welcome to some new faces. Ann Johnson has taken a share in Garrahalish – lucky lady! Nice to welcome John Powell from EPDS Racing here with his business partner Tracey. They liked what they saw, and have bought the remaining shares in Dontminddboys, who will now run in the EPDS colours. Great to have them as part of the team, now just a couple of shares left in this exciting horse – so do call if you would like to get involved. A blast from the past here last week in the shape of Dave Hearn, who used to have a share in Nautic, delighted to have him involved again, as he has bought a share in Dontminddboys. Great to have seen so many other owners here – we are very open house here as regards visits, and it’s always nice to see faces, old and new. Yard visits from clubs are also very easy to organise so if you would like a ‘morning on the gallops’ just get in touch. Back to the very early morning shifts this week (as opposed to the just early one!) as the horse flies have recovered from their near drowning on Friday and are back with avengance. Everything in in the day now as they were being driven nuts by the horrible little creatures, and then happy to be turned out in the cool in the evenings. We have a new member of the team as our farrier Arlo who has been with us for several years has moved to Dorset, and Charlie Sands who has been Arlo's cover has taken over the shoeing full time. We welcome Charlie and his team - and have requested winning plates only! The boys were busy yesterday as everything had at least front shoes on, in readiness to make a start on the walking. They will have a few days going on the walker as they start this years fitness campaign. The horses have all done very well with all the grass this year, and there are several who will be working hard to get their figures back! The only other bonus of 5am is that is so beautiful up here at that time - 'mist in the hollow fine day to follow' is ceratinly true and it was stunning this morning. Very warm at Stratford races last night - and Spurned Girl running a decent race. Much improved on last time, after a little adjustment to her wind, she jumps very well, and now looks to be really enjoying her racing. Once she gets a handicap mark she should go close. ground fast enough but with a good grass cover, and happily SG fine this morning. Its supposed to be a quieter time of year for us, but although the horses are mostly on holiday we still have 18 in and there seems to be a milllion jobs to do as well! Steam cleaning finished for another year - more successful this year with a machine from Fosseway Hire as opposed to the disaster that was HSS last year! Just the wooden boxes at Labrador to oil and 'housekeeping' done. Happily Hill Farm only needs the steamer! The team all trying to get their holidays in which involves a lot of juggling with plenty still to ride, on top of which Holly 2 (Spivey) has been called for jury service for the last two weeks. It appears that like degree courses, trials could cost a lot less if they just got on with it and had less breaks! As usual at this time of year its either all or nothing on the runners front. Paige and I made the three and a half hour trip to Fontwell with Autumm Spirit and our new addition Tommy, who was making his maiden voyage. Tommy has stepped into Toby's shoes as chief travelling companion, and did not put a tiny hoof out of line. A nervous day for the Lordy Partnership as Fizz has had a long break with several 'issues' to contend wit - Brian Wilson looking particularly green before the race. She ran well for a long way, and jumped for fun - just got a bit tiredup the straight - the race will bring her on. Robin, Kelly, and Toby made the considerably shorter trip to Worcester where Queen of the Stage and Playing with Fire both ran. Wayne Kavanagh on PWF, probably made too much use of her, and did not really see the trip out. Joe Palmowski on QOTS, who ran a super race first time over hurdles to finish fourth. Robin and I then had a couple of days in Devon which was lovely, and great weather, sadly not long enough! Back to the fray with three greys at Southwell. Playing with Fire staying on and looking as if needing further, having not got home previously! Mrs Merry has decided to retire her from racing now, and she will resume her stud career. A change of tactics for The Absent Mare,and and 'up front' clearly suiting her. she ran easily her best race to date, jumped for fun, and finished a good third. Pleased with her. Bally Lagan, favourite after his Worcester win was travelling like the winner at the last down the back, when he was on his nose for a stride! Joe did well to keep the partnership together, and they finished fourth. Three miles in a furiously run race proabably not ideal for BL, but still not out of the first four over fences is not a shabby effort! Not long now before everyone in from their summer hols. The flies are starting to be a problem so they will be glad to get into the cool of the stables during the day. Apologies for a lack of news - I have been in Ireland for a few days as support crew (general dogsbody) for Harriet who was doing Tattersalls International Horse Trials. Odd to see the sale ring turned into an eventing venue, but great fun, and the jockey and horse both performed extremely well. Back on the night ferry on Sunday, which is not to be recommended, as I drove back up the drive at 4.45 AM on Monday morning!! Sad news this week, as we had to have poor Toby pony put down after 20 years of devoted service to us and the horses. Everyone knows Toby, from owners to the horses and most of the racing community and I hate to think how many miles he covered whilst on duty keeping some of the 'silly billies' company on the lorry and at the races - or how many different tracks he visited! Toby arrive 20 years ago from Martin Charles who had bought him for his children, to live with a horse that 'box galloped' (a step on from box walking!) and then despite a couple of interludes to teach a few children to ride has never been far away. Our most valued member of staff and a great (sometimes stroppy) character he and Harriets' old pony Trendy have lived like an old married couple for years now - devoted to each other and basically free range here at Alne Park - they were always back in time for tea! No pause for breath from one season to the next these days, and after the excitement of Sandown it was a change of code two days later and Storming Harry making his debut at Windsor. A son of Miss Pebbles who we trained back in the day, and a very exciting day for Nigel & Jenny Thick who bred SH. A lovely introduction for him, he behaved perfectly and ran a nice race to be fourth. Another making a debut - this time over hurdles was Spurned Girl, another homebred - this time by the Hitchman family. SG had had some runs on the flat, and I think it fair to say that she had not covered herself in glory! She came with a few 'issues' and all credit to Malcolm who has quietly put up with her tantrums, and persuaded her that civilised behaviour is best! SG did not put a foot out of place at the track, and ran a decent race, jumping really well and seeming to enjoy the experience. She will come on for the run. Well we have come to the end of another season, and what away to finish! The first night racing of the season for us on Friday night at Chepstow, Entertain Me up 15 lbs for her win at the previous meeting, and running what was probably a career best, to finish second only beaten a neck. A brave run from her, sadly Mrs Merry not there to see her but cheering from afar! Dancing Daffodil again disappointing - blood vessel issues for her and a holiday beckoning - she will be be back! Home at eleven o'clock and then on the road again by ten on Saturday, Holly and I off to Sandown with the boys - Restless Harry and Kitegen for the final day of jumping this season. The Bet365 Gold Cup for Harry - a top quality race and one that was run at breakneck speed - Harry a bit outpaced on the first circuit and made a couple of small errors, which did not help our blood pressure, but Charlie doing sterling work and had him back where he wanted him as they went out for the second circuit. As they came to the pond fence Harry started to make ground and two out he was right there. The rest of the race was a bit of a blur, only clearer after watching the replay a few times, Harry fought SO hard and ran the race of his life to be fourth only beaten three and half lengths. None of us had any voice left afterwards, and it is difficult to put into words how proud we are of him. A proud day for the yard the other day at Newbury races when Malcom, who has been with us for a year now went to collect his award for Student of the Year at the British Racing School. The Twelve Club present the award every year to the best male and female student. I am not sure how many students would pass through in a year, but its a lot, and for Malcom to win the overall prize is a huge accolade for him. His family also came to see him receive his prize, and enjoy a day at the races - many congratulations in order. Another big day for a member of the team yesterday when Holly Rooney went for what proved to be her final X ray on the femur she broke so badly back in October. The team at the Walsgrave happy with the leg now and signed her off! Happy days. A really busy Easter weekend for us, Haydock on Saturday, with Kitegen and Garrahalish. Kitegen ran a blinder to finish second in a race run 8 seconds faster than average. Only small he jumps like a bunny, and Charlie came in full of praise for him. Garrahalish who also jumps brilliantly sadly was completely mugged by a faller early in the race - tripping him up and ejecting poor Charlie into outer space. Happily both were OK - Gary a bit stiff for a couple of days, but no lasting damage. Very Annoying as the race turned into a real staying contest which he would have loved. Where to start this weeks ramblings?? Priority I think must be given to our landlord Nic Allen who completed the London Marathon on Sunday in a very respectable time. To do the race at all leaves me in awe (knees would definitely not permit!) but to do it having had a week in bed with a stomach infection is something else. So huge congratulation to Nic who has been raising money for Cancer Research. Personally feeling as if I have run a marathon or two this morning, but I think its just a case of 'Lorry Lag'. Robin and I set off in 'Precious' (big lorry) on Friday night and caught the 2.45am ferry to Rosslare from Pembroke - nice! Then drove to Cork to watch Harriet compete on Saturday and Sunday, then back to pick up three new horses in Wexford on Sunday evening. All going well until we pulled into Sean Doyle's yard, dropped the ramp, walked back around to the front of the lorry to see water pouring out of a pipe in the engine - not nice! Finding a mechanic in the middle of nowhere on a Sunday evening was a complete non starter, but the lads at the yard came up trumps, and John (not an official mechanic, but soon turned into one!) and Mr Doyle senior saved the day by fixing offending water pipe, whilst we all retreated to the pub! An extra night in the lorry, and then a nervous run to the ferry early yesterday morning with everything crossed that the mending would hold up at least enough to get us back over the water followed. All was well though and the mend held up with no problems even with the four hour drive back from Pembroke. Very glad to see the end of our drive, and very glad to get into my own bed last night! After the excitement of the super double last week, it was back to reality on the Monday with five runners, split between Southwell and Kempton. Paige, Toby and myself headed off to Southwell, with Robin and the Hollies off to Kempton. Southwell, as usual devoid of much atmosphere, although the facilities for owners and staff OK. Troyan was first up and ran a nice race to finish fifth not suited by the track but not beaten far. Valrene ran a hugely better race greatly appreciating the better ground, finished flying, and won't be far away next time. Playing With Fire having her second run back, behaving really well in all the preliminaries (not always the case!!) jumped well, probably just needing the race again, but again, should not be far away next time. The less said about the weather the better really! The less said about the weather the better really! Everywhere off for us last week, except the all- weather, but then miraculously the Saturday meetings managed to be on! Graylyn Ruby was back to Kempton on Wednesday, unfortunately with a terrible draw on the wide outside. He ran a really good race to finish fifth, not beaten far, Luke Morris completely blamed the draw, and is confident he will go close again next time. Saturday saw 'Girls on Tour' - Holly & Myself - off to Ascot with Restless Harry, Toby pony and Garrahalish (plus four dogs). I can honestly say it was probably the worst lorry trip I have ever had, and I must have driven around the world a few times by now! The wind on the M40 was hitting us square on the right hand side and I don't think I managed to get above 45 mph all the way there. Pretty scary at times and the steps into the living kept blowing out so running improvisation on the hard shoulder with string and dog leads required! We were very glad to land at Ascot! The weather is now becoming more than tedious, with more and more meetings being cancelled due to water logging. Hard to keep the horses all dressed up with nowhere to go, so good to see Kempton putting on a jumpers bumper meeting last week. Running on the flat and on the all weather not a first choice for our runners but at least it got a racecourse gallop into them. Be My Witness and Miss Morn both having there first ever runs, both ridden by our conditional Joseph Palmowski, and both running well for a long way, on terms coming out of the back straight, they both then found the speed up the straight a bit much, but lots to like and they will both come on for the run. Rain, rain and for good measure a bit more rain! Rain, rain and for good measure a bit more rain! Several meetings off already this week, and heavy everywhere that is on. A pretty quite week on the runners front with only Badgers Cove & Restless Harry out this week. Badgers Cove to Southwell on Wednesday, in ground that he certainly did not relish. He made hard work of it, but looked as if he was hating the bog! A few very untypical jumping errors did not help, although turning in and hot on the heels of the leader I thought we might get there. Unfortunately the leader kept finding a bit and try as he might Charlie could just not rein him in. A good second though, and the third horse 28 lengths behind him. Better ground will help next time. Great to start another entry here with a winner. The New Year has brought so much rain that runners have been a bit thin on the ground, and coupled with a few coughs and colds, has seen only a few runners in the first couple of weeks of the year. A couple of pulled ups from Graylyn Amber (hated the very soft ground) and Garrahalish (dirty scope) did nor cheer us up much, but Cornish Ice running his usual solid race at Exeter on Tuesday to finish fourth. If ever a horse deserved to win it's him (along with Tom O'Tara) he has not been out of the first four this season, but just can't get his head in front. Richard Whitehead absent for the first time ever due to ill health.